Harley was grappling with conflicting emotions regarding what happened that night. After excusing his many slip-ups and bad behaviors, Harley's boyfriend had finally crossed into unforgivable territory by driving drunk and putting her sister in a coma. She could never forgive her boyfriend, but would Harley be able to forgive her sister for what she had done? Pro: This was a very moving read, and Mason did an amazing job making me feel each and every one of Harley's emotions. I felt her anger and her sadness, her joy and her shame. Her confusion and anguish over the situation with her sister was probably the most powerful for me, though, and I couldn't even bring myself to pick a side. Pro: Mason deftly addressed the addiction storyline. I really thought it was fantastic the way she showed how addiction can affect so many people connected to the addict. She also gave us different portraits of addiction - those who accept and those who deny, which I felt really added to giving me a more complete picture of a very complex issue. Pro: Speaking of complex issues, the relationship between Harley and her sister was super sticky. There was no doubt that Harley held a deep affection for her sister, but she also felt less-than because of her. The battle she fought between her heart and her feelings of inadequacy were rather heartbreaking. Pro: What an emotional growth spurt Harley experienced! Her sister's accident was a rude sort of wake-up call, but a wake-up call none-the-less. It forced Harley to really examine her relationship with Mike, and to make some tough choices for herself. Pro: A lot of Harley's truths came to light via flashbacks, which I thought were utilized very well. We see snapshots from her past featuring her sister, Mike, and Raf, which were very telling, and sometimes, very sweet. Pro: I saved the best part for last - I wanted RafAndHarley to happen from that first cigarette. He was someone positive from her past, who was now becoming someone positive in her present, and then there was that amazing "gesture" towards the end, that just solidified my need to have these two together. Overall: An honest and hopeful story about addiction, family dynamics, trust, forgiveness, and the strength it takes to change. ** ARC received in exchange for an honest review. Two years after hitting bottom, Suzanne was happy to be returning to the one place she felt she belonged and to her two best friends, Caddy and Rosie. Adjusting to life in Brighton on her own was not as easy as she thought it would be, but it ended up being an eye opening, and positive, experience for Suze. Pro: I was ecstatic to catch up with Suzanne, Caddy, and Rosie. Though this was Suzanne's story, Barnard still dedicated a lot of time to the trio's friendship. The ups and downs and ins and outs were explored, and I was happy to see their friendship grow along with them. Pro: This was such a raw and honest look at Suzanne's life. She had some really difficult moments in this book, but she also discovered so much about herself. She came to terms with some things from her past and was finally able to set her eyes on the future. Pro: It was really sad, that Suzanne's family could not love and support her in the way one expects from their family, but she was so lucky to have assembled such a wonderful support system, even if it took her quite a while to realize they were there for her. Caddy, Rosie, Matt, Aunt Sarah, Kel, and Dilys -- I adored them all, because of the way they loved, supported, and encouraged Suzanne. Pro: The friendship that developed between Suzanne and Dilys was so, so special. It was very pure and beautiful. These two lonely souls found comfort in each other, but they also gave so much more to one another. This was definitely one of my favorite parts of this book. Pro: Barnard is so good at writing boys! Both Kel and Matt won my heart. They were sweet and considerate and that brand of soft boy that I love so much. Pro: I just re-read the ending again, and yes, there are tears sliding down my cheeks. It was just really lovely to see Suzanne moving in the right direction. Was it perfect for me? No, because there are two or three things I would have changed, but it was touching and heartwarming and I was happy for Suzanne. 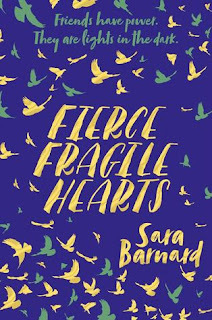 Overall: A total gift to those of us, who loved Fragile Like Us, but also a book that stands on its own. It was heartbreaking, heartwarming, and hopeful. After a near fatal accident, Jake begins to question some of the traditions surrounding Otter hockey, but is Jake willing to risk his future to challenge traditions that have endured for over 100 years? Pro: Cross impressed me by taking on this topic. It was a rather interesting look at how entrenched these traditions become, and how difficult it can be to abandon those which are toxic. The characters' reactions and struggle with the situation came across as very authentic, and I appreciated how she let us view the issue from multiple sides. Pro: Let's hear it for finally getting a women's team in Juniper Falls. It was rather exhilarating watching this team get their footing and finding some success in their debut season. Pro: This story can be read as a standalone, but Cross also incorporated a bunch of characters from the previous two books. I always love catching up with old friends, and I was so happy with the future she gave to one of the side characters. It was great getting to know this character a little better, and also seeing things starting to look up for him. Pro: Both Brooke and Jake are extremely likable. Brooke's backstory was sort of heartbreaking, but I couldn't help but be impressed with how she dealt with her situation, and came out stronger because of it. And, I admired Jake for taking a stand on a tough issue. He had the deck stacked against him, but he still chose the high road, and I was proud of him. Pro: The romance was so sweet, and I was absolutely on board with this ship. The circumstances bringing these two together were less than ideal, but something real and beautiful grew out of it all. Both Jake and Brooke were there for each other and offered support and comfort when they really needed it. Their romance growing from a sort of friendship made it just that much better. Pro: Although it was slightly abrupt, I still loved the ending to this book. Cross gave me closure as far as the fate of the team, the town, its inhabitants, and this couple. I was left feeling very satisfied and extremely happy with the way things turned out. Overall: I fall more and more in love with this series with each book. Once again Cross delivered a story with substance that incorporated family, friendship, romance, and left me hungry for the next book. Love these short reviews. Looks like you are on a roll with some great books. This was a stupendous batch of books. I don't remember if I read them all in a row, but I definitely read them close together. I'm so happy that Mason's first book was a success! It's probably not my type of read, but I'll definitely be pointing people in her direction! I was all about Lizzy Mason's book. I found out afterwards, that it was actually own voices, and she really did bring a special insight when it came to the addiction issue. The Art of Losing sounds incredible. I love that it shows how addiction affects so many people, not just the individual suffering from it. I liked that she had someone in denial, someone in recovery, a victim of someone's addiction, and family members of an addict all giving their points of view. I thought it was handled really well. Sounds like all three books were excellent. I am most drawn to the third one as I love books about sports and I haven’t read a book featuring a female ice hockey team. Sounds like a win to me. I am really loving the Juniper Falls series, and sports romances are my thing. Extra points for finally letting the girls play. The one thing Cross always does is have actual hockey action in her books too, and this time, we get to spend some time on the ice with the new women's team. Oh I love all the glowing things you said about the art of losing. I am so picky on my contemporary. This one has me intrigued. Oh my gosh, the art of losing! <3 There's so much there to get in to, but most of all the sisters' relationship -- it sounds so promising! I am really glad you were able to enjoy Sara Barnard's latest book. That makes me so excited to read it myself. The main character sounds amazing and I love how good she is at writing male characters too! 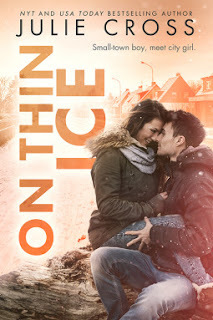 On Thin Ice sounds like an important book. I am all for the romance but I am glad it deals with traditions and even though they are familiar they should be examined and can change or be demolished if they are harmful or toxic. I love Barnard! I need her to release more books over here. 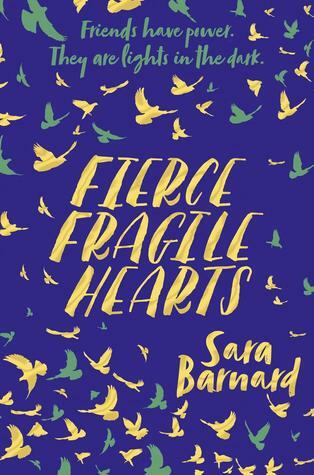 I was lucky enough to win Fierce Fragile Hearts on Twitter, because it's not getting a US release. OMG, all I had to do was read the summary of Art of Losing and I'm making grabby hands at the screen but then you've rated it so highly and I want to read even more. I have to say, it's not often I get excited about reading YA lately but that book definitely makes me want to read. And I like the sound of On Thin Ice simply because female athletes! But the story does sound interesting, I saw this reviewed on another blog and I was interested and I know I've seen folks talking about the past books in the series being good so I might need to read this. 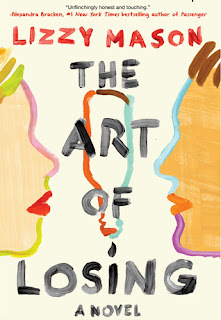 Art of Losing was a really great look at addiction, and I felt like the author covered the issue quite throughly, while delivering a million feels. I am a fan of the Juniper Falls books. I was surprised such a serious topic was tackled in the book, but it's super relevant in many areas, not just sports. Looks like I need to add all of these to my list. On Thin Ice was there already. I love your In A Nutshell reviews. To the point. I love it. Thanks, Mary! On Thin Ice was great. That whole series is great. I hope you get a chance to read it.